Getting on top of a cockroach infestation, especially if they’re the small (German) cockroaches, can be a big challenge. Supermarket products just don’t seem to work! Cockroach gel baits – the same products professional pest controllers use – are now available to the general public. These gel baits are definitely the best option to control a cockroach infestation, but how do you use them to get the best results? Cockroaches are nocturnal, coming out at night to forage for food under the cover of darkness. When morning comes, they return to their hiding places, which can be well hidden and hard to find. To get lasting cockroach control you need to tackle the source – the nest. But how do you find a cockroach nest and how many could there be in your kitchen? Fear not...a cockroach gel bait does all the hard work for you! HOW DOES A COCKROACH BAIT WORK? A cockroach bait consists of an attractive source of cockroach food and a slow acting insecticide. When cockroaches leave the nest to forage for food, they find the attractive cockroach bait, eat a lethal dose and die a few hours later, often back in the nest. This delayed action (the reason for the slow acting insecticide), is vital for complete colony control. A large part of a cockroach problem is that the young cockroaches tend to hide in the nest and don’t even leave to forage for food. They eat the droppings and vomit of adult cockroaches (gross!). When the adult cockroaches return to the nest after eating the bait, small amounts of the insecticide end up in their droppings and vomit. This allows transfer of the insecticide to the nest inhabitants where complete population control is achieved. A cockroach bait is the only type of cockroach treatment that targets the young back in the nest. 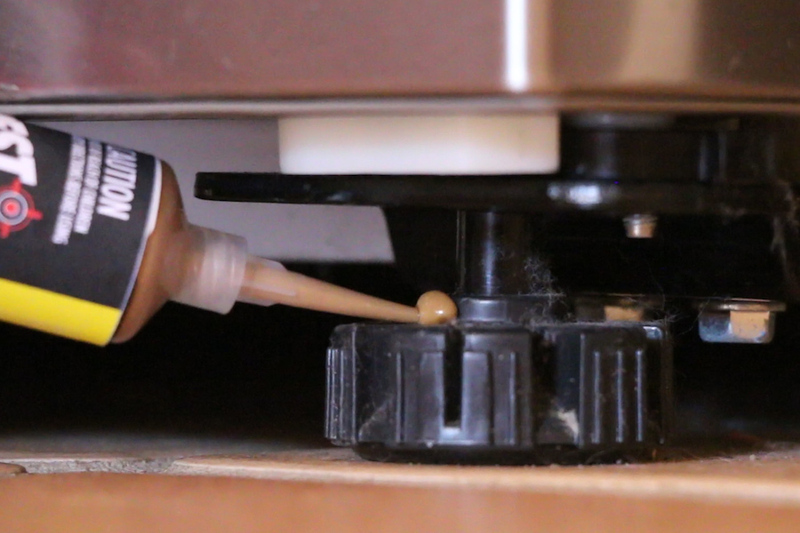 By placing the gel bait around the kitchen, you can target all the cockroach hiding places without having to find them. Foraging cockroaches will find the bait and take it back to the nest and solving your problem. ARE ALL COCKROACH BAITS THE SAME? No, they’re not. Standard supermarket cockroach baits consist of a solid food block housed in a plastic ‘bait station’. They’re not as attractive to cockroaches as gel baits. Gel baits such as PestXpert 2 in 1 Cockroach Bait are more attractive than solid baits, as they release more volatile attractants, which cockroaches can “smell” from a distance. The other problem with the plastic bait stations is that you’ll only get a small number of bait stations in a packet. This limits the number of places you can target cockroaches. As you don’t know how many cockroach nests there may be, or their location, success is greatly improved by placing a large number of bait ‘dots’ instead of a few plastic bait stations. As the gel can also be placed in a wider variety of positions (e.g. on vertical surfaces), it’s more likely you’ll place a gel ‘dot’ near a hiding place. The superior attractiveness and flexibility in application make gel baits the number one choice of pest control professionals. PestXpert 2 in 1 Cockroach Bait is unique as it contains 2 active ingredients. One active ingredient targets the adult and mature nymphs while the other disrupts juvenile development delivering a powerful two punch knockout blow to the nest. The PestXpert 2-in 1 Cockroach Bait comes in a professional syringe applicator. This means it’s easy to apply. You can apply it to hundreds of locations. You only need apply a small (pea-sized) amount of gel bait in each location. It’s important to place gel bait every metre or so inside cupboards and around suspected cockroach hiding places. Electrical goods – (inside and underneath) microwaves, TVs, dishwashers, toasters, fridge/freezers, cooker tops/hoods, and washing machines. Follow all safety instructions before application. Sinks – around and underneath. Check sealant to make sure water doesn’t drip into cupboards underneath. Kick-boards – behind them. Try to seal any joints or corners. (Follow all safety instructions before application). For the best results, don't use cockroach sprays near gel baits. Sprays tend to be a repellent to cockroaches, so a surface treated with a spray may make the bait unattractive. A good option is to use a spray around the perimeter of the kitchen on the ground and use a gel bait in the cupboards and other areas above the ground. Inspect the gel each month and re-apply if necessary. The gel will remain attractive for at least 3 months. If you want to apply fresh bait, the old bait will simply lift off with a knife. HOW QUICK WILL IT WORK? Complete control of the population should occur in a week or two, although it may take longer with a major infestation. If you suffer from ongoing cockroach problems (for example you may be in a unit block), re-apply the bait every 3-6 months. With PestXpert 2 in 1 Cockroach bait you really do have the product to deal with cockroach problems “just like the professionals”. With a tastier 2 active ingredient bait, in more locations, you’ll get control faster than a standard plastic bait station. For more information on cockroaches, prevention tips, control techniques and other cockroach products, check out our cockroach treatment page.